Click image to visit our campaign page with resources and promotional materials. As the school year begins, an inspiring struggle is playing out in North Dakota. Led by the Standing Rock Sioux, Indigenous people from across the United States, Canada, and Mexico are gathering to oppose the $3.8 billion Dakota Access pipeline, which would threaten to contaminate the Missouri River. The “bulldozing” of Indigenous lives, Indigenous lands, and Indigenous rights all began with Columbus’s invasion in 1492. “With 50 men we could subjugate them all and make them do whatever we want,” Columbus bragged in his journal on his third day in the Americas. His policies in the Caribbean led to a horrific loss of life and culture. Columbus set the pattern for all subsequent European invasions. 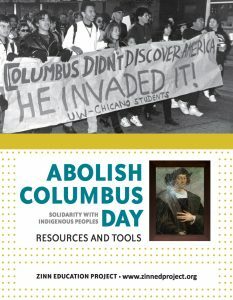 In solidarity with Indigenous peoples throughout the world, the Zinn Education Project has joined the campaign to Abolish Columbus Day. Celebrating Columbus means celebrating colonialism, celebrating racism, celebrating genocide. It’s time that instead we paid tribute to the people who were here first, who are still here, and who are leading the struggle for a sustainable planet. Join us in abolishing Columbus Day and celebrating Indigenous People’s Day in our classrooms, our schools, our communities, and our country. I agree because Columbus wasn’t the first person who found it anyway. How can you find something that was already found by the Native Americans and then take over and try to torture them. So basically, he was in the wrong.